How to get there: Uppsete is a good starting point for this area. Uppsete is a railroad station on the Oslo to Bergen line. The station is just west of the better known station Myrdal, a single. long tunnel separates the two stations. The travel time is approximately 2 hours by train from Bergen. The station is located at North: 60:43.517, East: 007:00.687, at elevation 850 meter. To Kaldevasshytta, From Uppsete, the normal ski route follows the summer route that is marked on the map. Ski north-east up along the river towards the lake Jernhusvatnet (1012m), but stay right. The route shall circle around Sauafjellet (1339m) on the north side, then turn south on the east side of this mountain. You will pass south of Geitavatnet (1127m), as you turn south through a very distinct pass leading to a small lake at elevation 1200 meter. Continue south-east climbing to point 1245 before descending back to the 1200 meter level as you locate a narrow pass with a creek. Go through this gorge and climb the hill on the left (east) side of the creek. Follow this hill as it turns south-west and enter the Kaldavatni (1251m) area. The DNT hut is straight ahead on the small ridge net to the lake. The coordinates of the hut is North 60:42.129, East 007:04.726, elevation about 1270 meter. The hut is open all year, there is no food, but otherwise fully equipped for receiving hikers/skiers on a self serve basis. Members of DNT (the Norwegian Mountain Club), have preference and receive a substantial discount. To Vassfjøra, This is a winter route, the trip is substantially more complex in summer. Ski east from the hut down to the small lake, then south passing an old dam and onto the larger Kaldavatnet, 1252 meter. Keep on the right hand side of the lake as you ski south to the distinct saddle west of a small hill at the end of the lake. There is also a saddle on the left (east) of this small hill, however, the best route is to keep right. Climb the small hill and access the next lake (1299m), you will see the quite steep side of Skipanuten (1499m) up to your right as you descend to the third lake (1289m) and further down to lake 1271. At the end of lake 1271, it is likely best to ski left (east) of the creek. We stayed on the right hand side and crossed a slightly steeper section there (about 10 meter) on foot (see picture below). Descend along the creek to the small pond, then the somewhat larger triangle shaped lake at elevation 1230 meter. A distinct hill (1346 m) is right in front across the lake. Ski near the end of the lake (where the creek starts) and climb a small shoulder south east of this hill. Descend slightly and enter the valley south of hill 1346. 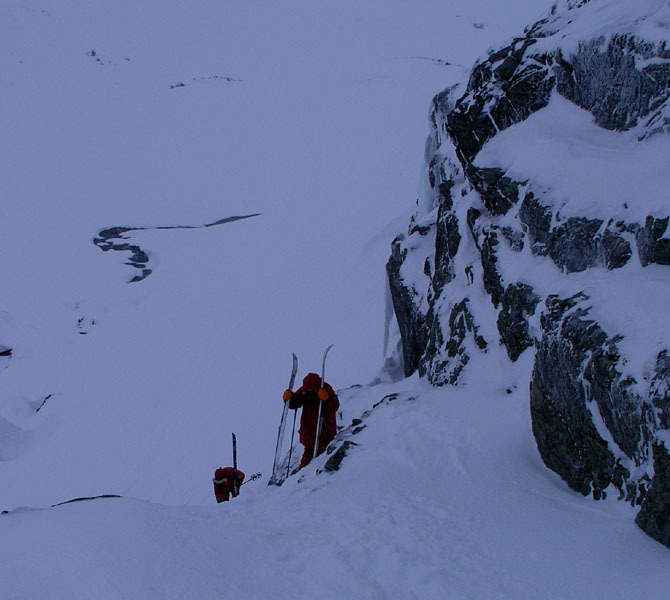 Start the ascent of Vassfjøra along ridges and find a line that takes you further east as you gradually climb to the north-east end of the main (top) ridge of Vassfjøra (1540m). Continue south-west, there are several "false" summits, the top ridge is about 2.5 kilometer long. The return route reverses this description. Comments: I made this trip with my sons Tor Erling and Pål Jørgen. We started around 0830, just as dawn started to provide some light. We hit the top at 1200, spent about 15 minutes before returning to the hut at 1515. The weather was overcast, white-out conditions made downhill skiing unpredictable. On the return, the clouds lowered, it started to snow and the wind picked up. 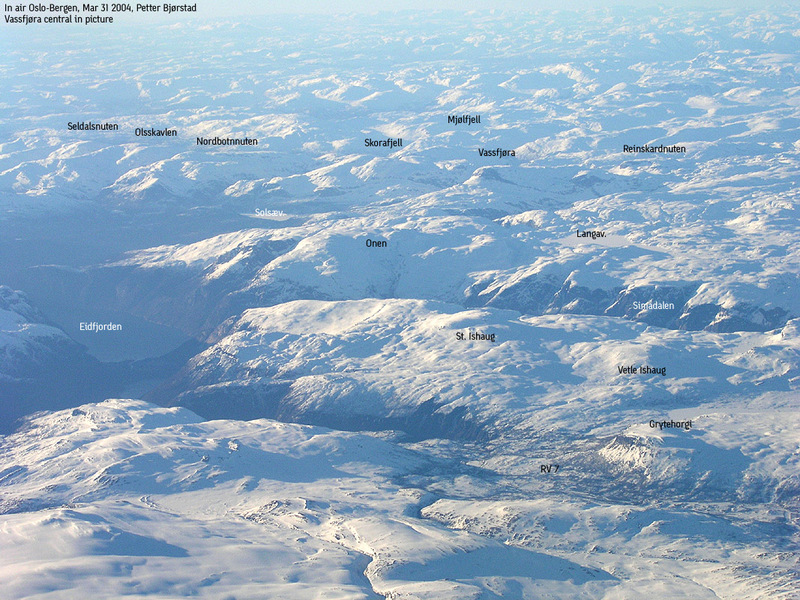 Vassfjøra and nearby mountains as seen from the air. 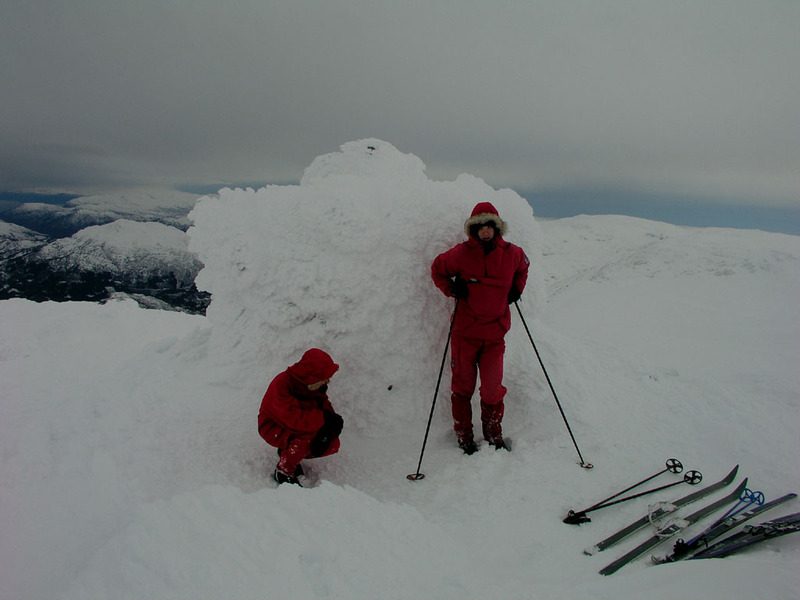 On the summit of Vassfjøra, Pål Jørgen and Tor Erling. Panorama south from Vassfjøra. Onen 1621m, and Store Flåtten 1616m, the Hardangerfjord and Midtfjell 1255m. Climbing a short, steep section south-east of Skipanuten, east of the creek between lake 1230 and lake 1271.